Will Becky Lynch be able to secure her place in the WrestleMania main event? 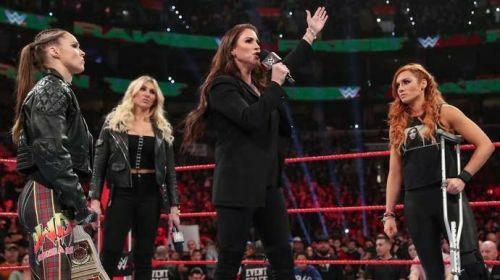 Ever since Survivor Series, Ronda Rousey, Becky Lynch, and Charlotte Flair have been stuck in a feud that was heading towards the WrestleMania main event. Lynch was supposed to face Rousey back at Survivor Series but an injury forced her to withdraw from the match and be replaced by Charlotte Flair. The Queen left quite the impression on Rousey, who won their first encounter via DQ and was then beaten down by Flair following the bout. Lynch and Rousey were then prepared to face off in the WrestleMania main event before she was suspended for her lack of professionalism and replaced once again by Charlotte Flair. Now Lynch's shot at the WrestleMania main event is on the line and The Queen is the only woman who stands in her way this weekend at Fastlane. Becky Lynch and Charlotte Flair have a storied history together, the two women have battled a number of times over the years after coming through the ranks in NXT as half of the Four Horsewomen. Lynch isn't one hundred percent right now given the fact that she's struggling with a knee injury and was attacked by both Ronda Rousey and Charlotte Flair this past week which has left her participation in this weekend's match up in the air. Lynch needs to be part of this WrestleMania main event since she has been the woman spearheading the Revolution over the past few months. The former SmackDown Women's Champion was able to win the Women's Royal Rumble on one leg so it isn't much of a stretch to think that she will be able to win a one-on-one match the same way.